Last Saturday saw the Narrow Planet tour bus head to Sparsholt near Winchester for the biannual Narrow Gauge South – which is always a cracking show and this year no exception with around 30 layouts and a lot of trade support. Mostly orientated to 4mm:ft scale as the show hosts the 009 Society AGM, but a good number in larger scales too. Obviously running a trade stand and attending the AGM doesn’t leave a huge amount of time for walking around looking at things, but I think I had a glance at most of the layouts on display. It was great to see some of the developing projects up close, including Isle Ornsay and the to-be-epic Bron Hebog, and the recently finished such as Ryedown Lane. And at the other end of the spectrum a rare appearance from Christopher Payne’s Portpyn on the 18th anniversary of its first show – also at Sparsholt. One of the best things about an event like this is the chance to see the range of modelling styles and approaches people take, and the “talking shop” aspect is also great to get thoughts and ideas in motion. It’s very hard to explain exactly why, but I’ve come to the conclusion that I just like 009 and I want to do more of it. Notwithstanding the O16.5 layout and models in other scales lurking in my office demanding attention. Not many photos were taken by me but you can get a feeling for the day from the cameras of Michael Campbell, Julien Webb and Ted Polet. 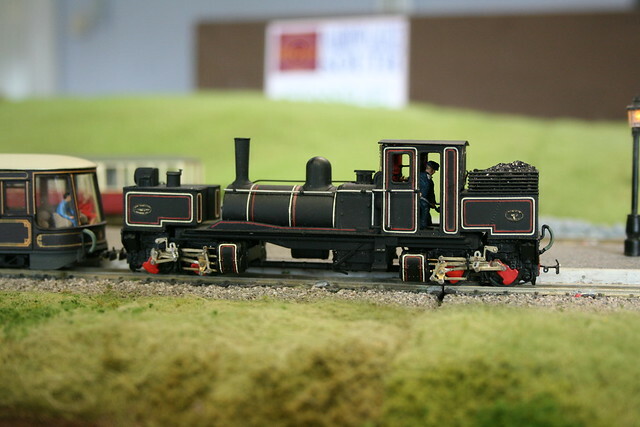 This entry was posted in 009, model railways, narrow gauge, sparsholt. Bookmark the permalink.